I am in Uruguay. You can smoke ganja here if you want, but I don’t want. Montevideo, Uruguay has been my home for the past three months. Where is that? It’s in South America, east of Argentina, almost at the southeastern edge of the continent1. I am a little ashamed that I have not yet shared anything about my journey with you. I was a little bit occupied with explaining to my closest friends my motives for coming to a country which most people without a deep interest in football or geography would not have known existed until marijuana became legal here. I have not met many locals who know another Jamaican, but while they are not familiar with our people, most Uruguayans have had significant exposure to and greatly appreciate the stronger elements of our culture – Reggae music, athletics and the good old I-science which, I cannot convince them, is still illegal in Jamaica. I ordered a box of 12 so I could photograph them for you but by the time I finally took the photo, only one remained. 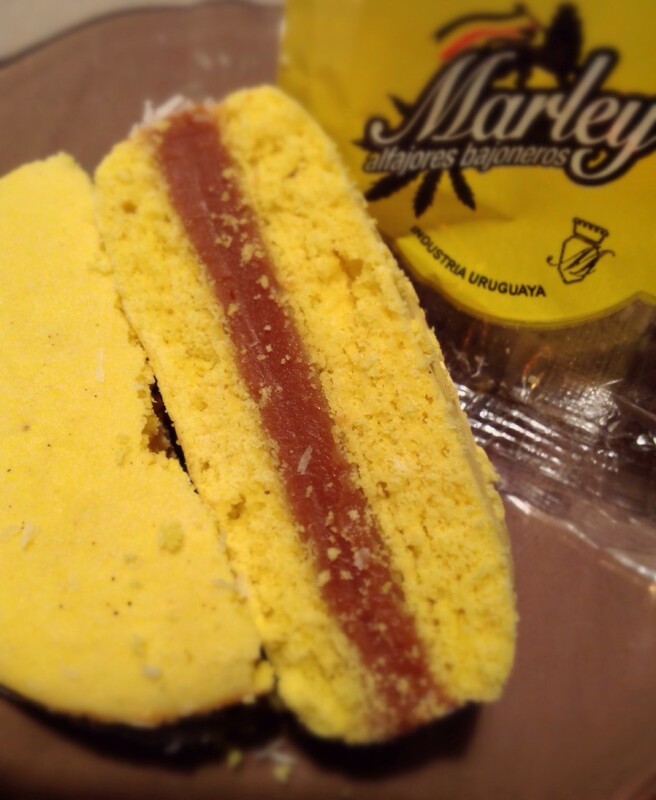 There is a special pastry filled with dulce de leche (caramel), which is made especially to combat the munchies and the downer one has after a smoking marijuana; they are called Marley Alfajores Bajoneros2. It’s a bit disappointing that Jamaica is the cultural authority on marijuana, but we don’t have a local snack specifically for the munchies. I’m thinking of sending an evaluation parcel for my weed-headed amigos and exporting them to Jamaica, depending on the outcome. Montevideo has made me a better cook. In my former life, I enjoyed eating out3 but the flavours I have come to appreciate do not exist here. The unofficial national seasoning is salt and restaurants are no longer allowed to add it to your table as a condiment so my dining experiences have been poor; consequently my culinary skills and motivation have gone through the roof. 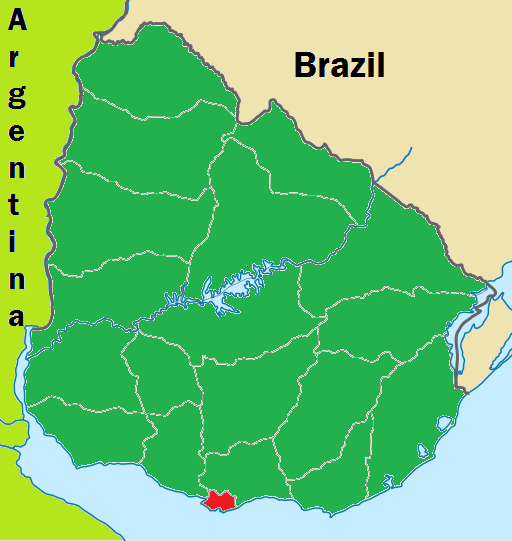 Uruguay is the undisputed capital of fresh and tasty grass-fed beef – the Jamaican agriculture minister would appreciate knowing that oxtails4 and rice5 are inexpensive here. 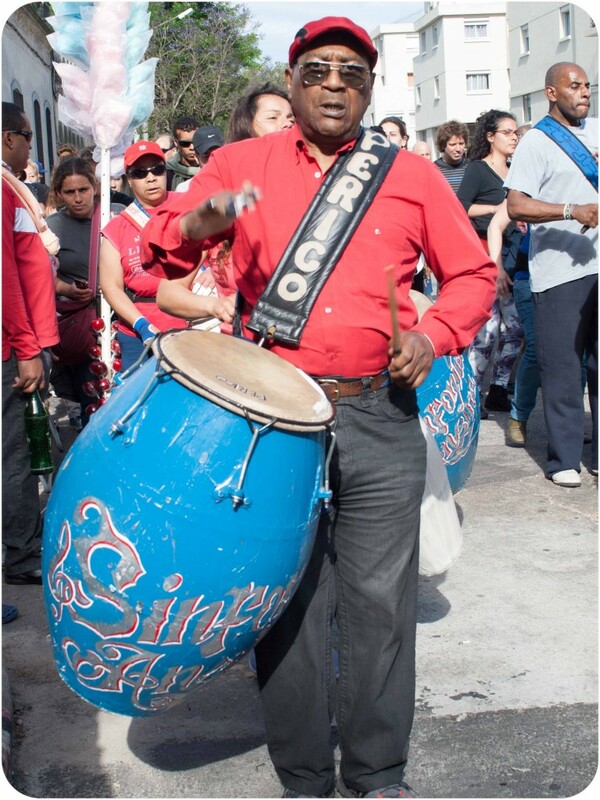 The ferias in Uruguay are much like the outdoor markets that may be found in every Jamaican town except they are not permanent fixtures and each community has its own feria/market day. There are neither scotch bonnet peppers nor soursop6 but there is an abundance of avocado and a few battered Bombay mangoes. I am taking it in stride and learning to love the not-so-tropical offerings which are just as healthy and sometimes less fattening. Each Wednesday I am blessed with an abundance of fresh food right outside my window; these and the spices from the care package my mother brought have made creatively delicious meals. Is it as a result of slavery why we are not traveling more? Based on the response to my trip, I have concluded that Jamaicans are unwilling to take an adventure into unknown territory, or travel for a reason other than luxurious comforts, economic opportunity or bright lights and shopping. I wonder whether our consciousness was smeared by the middle passage, that dreaded journey our kidnapped or purchased ancestors were made to take into this ‘New World’. I wonder if we are afraid to discover new worlds now that we are [somewhat] able do so voluntarily, merely because of the indelible scars and innumerable lives we lost on our involuntary journey here, to the Americas. Or perhaps we are not traveling more because, the same entities that forced our migration to this New World have created barriers to keep us out of their old world, or control our access to it now that we are, supposedly, free people. Of course, they are free to come, enjoy and return as many times as they wish. 65% of the world requires that Jamaicans obtain a visa before traveling to their shores7. It’s very disappointing that Jamaicans need to pay fees to request permission to knock at the gates of the major beneficiaries of the slave trade and please note that they do not have to accept us, even with a visa. The political class is perfectly aware that the world they created is no longer economically desirable, there is limited opportunity in Jamaica – we need to travel abroad for work and education, and they have reinforced their walls, and in their kindness leaving us with a religion that takes away all earthly hopes of anything better than the here and now, a religion that consoles us with the promise that in death we will fly away, travel to a heaven and have a better life than we ever dreamed of. El Perico Gularte is a senior player in his comparsa. One of the things I love about Uruguay is how they have retained their African heritage and encourage cultural events that show them off. British Minister for the Caribbean, Mark Simmonds made it clear that his country cannot compensate for the sins committed against us 400 years ago, but they can try to help us revive our economy. I think the pecuniary debt needs to be carefully calculated and acknowledged, even if it cannot possibly be repaid, even if we cannot trust our corrupt governments to handle the money. A debt write-off would be good, too. The UK and other Europeans nations should consider starting the psychological reparation process by pretending they believe all humans are equal and not try to disguise their institutional xenophobia and racism in immigration control. It is quite a feat to enslave a particular group of people for over 300 years and then manage to shape the world’s consciousness that they are the ones to be feared. The world has a problem with Jamaica, but Jamaica doesn’t seem to have a problem with anyone, except Haiti. I still cower at the recollection of how we ejected the Haitian delegation of the 2011 Under-17 football tournament due to suspicions of cholera. In fact, most of the Caribbean perceives Haitians as second-class humans, and regional outrage was lacking when news broke that their nearest neighbour, the Dominican Republic, stripped over 200,000 Haitian immigrants and their children of citizenship. We do not seem to see the dishonour in this and I am saddened. Again I say, we must look within ourselves and fix our attitudes towards each other. Hand-washing is not so bad after all. My apartment did not come equipped with a washing machine and I cannot afford to buy one. To my surprise, I discovered that there are no self-service Laundromats in Montevideo; I have to leave my laundry at the mercy of the attendants at the lavadero. Tranquilo. 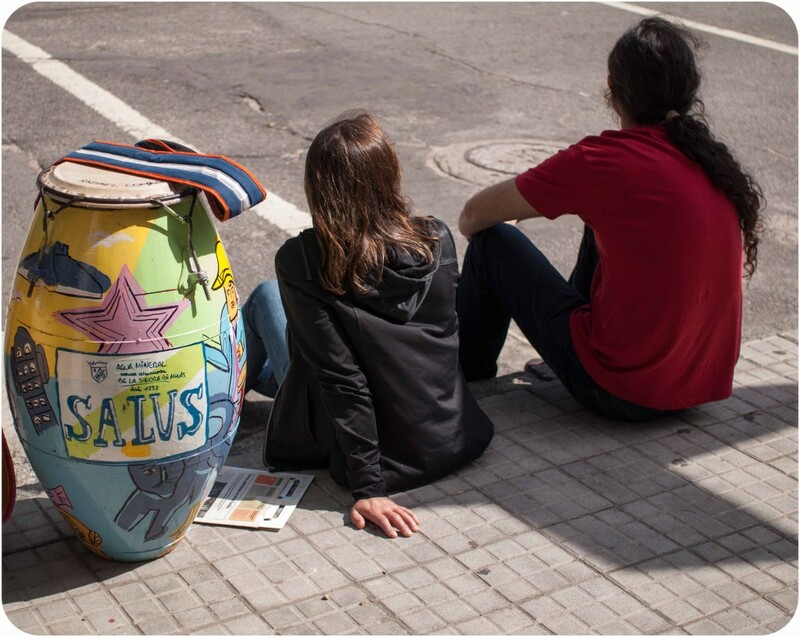 In Uruguay, you cannot escape the waiting. Grab a chair, or sidewalk. The glee of having my clothes laundered, ironed, folded and fluffed for a nominal fee was short-lived. When I discovered that my white blouse was washed with my new black jeans, I decided I had to handle my own business; I now wash all my light-coloured clothes by hand. I have even mastered the reproduction of the soothing sound I woke up to on many Saturday mornings of my childhood. Scrups-scrups-scrups. My clothes look, feel and even sound clean! Yes, dear friends, with the right detergent8, background music and a little bit of patience hand-washing is perfectly therapeutic. My greatest dream has been to travel and now that I am a responsible adult, I will pursue it. Not just to go to big cities with bright lights where I can buy new, shiny stuff to brag to my friends about. Not for luxury or comfort or financial opportunity but to see the world. Really see the world, and not just the popularly photographed landmarks or name-brand hotels. So what am I doing in South America? I am freeing myself through travel, discovering new languages, listening to my inner consciousness when it tells me that ‘home is internal’, experiencing the greatness of humanity and binding myself to the beauty in this world. P. P.S. Jerry9, if you’re out there, please get in touch. I might have a goat to curry. This entry was posted in Featured, Uncategorized and tagged #JamaicanBlogger, culture shock, expat, expatriate, Jamaican blogger, jamaican in uruguay. Bookmark the permalink. Post a comment or leave a trackback: Trackback URL. Excellent and entertaining as expected. Great stuff Karee. Keep blogging and sharing what you see and think. Very interesting idea on why we dont travel more. I figured language and our devalued dollar influenced this. interesting views as to why we dont travel. maybe our view of the world would be diffferent if we all get that chance to travel. Very nice. I’m looking forward to seeing more about your sojourn in Uruguay. Intriguingly, when I started graduate school, back in the 1980s, the Caribbean politics course at NYU was taught by an expert on Uruguay, Martin Weinstein. His monograph on Uruguay in the 1970s was subtitled “The Politics of Failure”. It’s actually a pretty decent book. Very informative and extremely well written. I can now live Uruguay vicariously through you and gain the power of knowledge. One disagreement we have however is your view that Jamaicans do not like to travel. I have Jamaican friends/acquaintances in every continent outside of Greenland and in almost every country within those continents. Even within the USA and Canada, I find Jamaicans in the most remote and unlikely places, and since we all think we are chefs, the traditional “Patty Shop”. Keep up the good work and I’ll be an avid reader. Beautiful and insightful! Love it! Great post Shelly and excellent analysis of Jamaicans and travel. Interestingly enough Jamaicans don’t even want to travel to other parts of Jamaica unless they have relatives there or if its for a popular attraction like Dunn’s River or a party like ATI. We go to the beach and come home. I remembered once someone asked me why would I go to Belgium . My answer was why not? If travel is not for economic gain we often see it as wasteful or just narrow it to saying the person has money and can therefore afford to do it. Going to the US is often to visit family who often treat us to shopping sprees so we come back with goodies so that is not considered a waste . I’m so proud of you for taking the bold move and for thinking outside the box. I have often wanted to do the same but thought too long of the financial aspect of it and convinced myself that I couldn’t afford to do it which I know with a proper plan it’s attainable. Looking forward to read more about your journey. Great post…Jamaicans (or this Jamaican) would travel more if money and visa opportunities allowed…my job has blessed me to go to various countries for training and conferences, but there is no way I’d be able to go to those places on my own dime. Excellent piece of writing, Karee! Intriguing! You have aroused my “appetite” to travel again….this time, South America! I have always had this morbid fear of the region, but you have dispelled all that with this account of your sojourn in Uruguay!